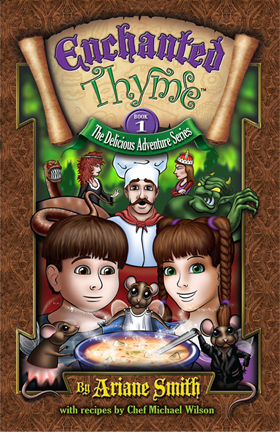 Enchanted Thyme – Book one in the Delicious Adventure Series. That night, as Peter and Belinda drift off to sleep, they're visited by three winged kitchen mice named Marjoram, Basil and Rosemary who whisk them off to the land of Enchanted Thyme. There they discover a mystical forest heavy under the dark spell of the Fricassee Fairy. 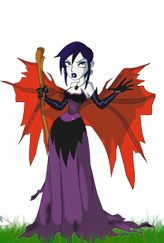 The Fairy's powerful curse of eternal hunger has stricken the land's Queen Topstead. Everyone in the kingdom is topsy-turvy trying to find a meal that will satisfy the Queen's longing and appetite. Peter and Belinda are chosen to help the royal kitchen's master chef find just the right secret ingredient for a dish that will satisfy the royal appetite and restore order. Will they ever be able to break the Fricassee Fairy's curse once and for all? Well … fairy tales can sometimes come true.